Most people have heard the story of Peter walking on water (Matthew 14:22-34). He made a request to Jesus (who was also walking on the water) to be able to walk on water and Jesus granted his request and told Peter to come to Him. 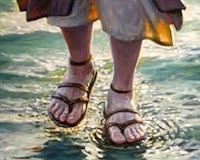 Peter walked on the water towards Jesus. That is until Peter looked at the strong winds and the waves and he became terrorized and began to sink. And Jesus reached to Peter and pulled him to safety. We read the story and are either amazed that Peter was able to do so or we write him off as faithless because he was afraid and sank. 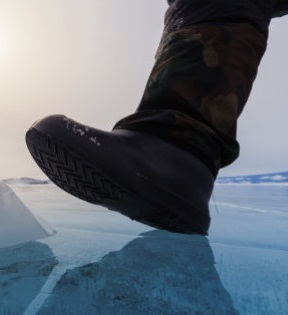 I personally have spent a major portion of my life walking on water; which really isn't that hard considering the fact that it is in a frozen state when I do so...Usually going thirty miles per hour with a piece of 1/4" steel strapped to each foot. So walking on water (for me) doesn't seem to be that big of a deal...that is until I try to do so when it it ISN'T frozen or else when I don't have skates on. Then, for me, it is very hard to walk on water. I ran into this recently when I was making my rounds around the local ice rinks picking up hockey pucks. I hit a patch of ice (on the ice) and my feet almost slipped from beneath me. Almost; but I didn't...and I was able to stabilize myself and not fall down. I voiced a "thanks" to the LORD for His intervention as I continued my journey around the rink and then made my way home. 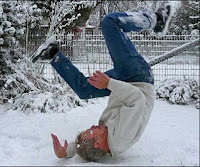 When I arrived home and stepped out of my vehicle, I hit a very small patch of ice in my driveway and went from standing upright to a horizontal position of the ground in a millisecond; tearing my jeans as I cut my knee on the frozen ground. I voiced a "thanks" to the LORD for His intervention as I brushed myself off and went into the house to attend to my knee that was now bleeding. As I was taping a gauze pad to my knee, I pondered how I was unable to do the simple task of walking on a tiny piece of ice; after all I do it several times a week on rinks that are about 1,400 square feet. The piece of ice that I slipped on was only about one square foot! Had I, like Peter, taken my eyes off the LORD; troubled by my surroundings? 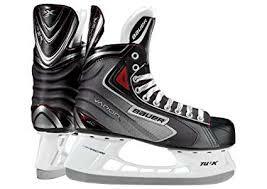 No, I was simply missing a key component necessary for me to walk on water; my ice skates. And yet, like Peter, I realized that even with skates I still need the LORD to do what I do. My ability to walk on water was predicated by my ice skates. That slip on the ice in my driveway was a wake-up call to me how complacent I can get as I look to myself to do what I do. Symbolically, the ice skates represents the gifts, abilities, and anointing that comes from the LORD that enables me to do what I need to do. I realized (as I was bandaging my wound) just how vulnerable I am in this life; how dependent I am upon the LORD. There is no way that I can walk through the slipperiness of this world on my own efforts or strength. And just like walking on ice, it doesn't matter how often or many times that I have done something...Simply put, I NEED HIM FOR EVERYTHING THAT I DO! So I pondered...how many times have I tried to do things in my own strength and abilities as I lean on my past experiences? How many times have I ignored the near slips or the actual slips as opportunities for me to hear the LORD calling out to me to look to Him instead of myself? Bottom line: we ALL need Jesus. One of the problems with having successes is that we have the illusion that we can do this on our own, and so we slowly drift away from Him. But when we slip and fall day after day after day trying to do things in our own strength; that is when we become more aware of how much we need Jesus. Keep your stick on the ice; I'm pulling for you!